You run an HVAC company. You want to grow your business by automating it. You’ve heard there are tons of great apps to help you automate and grow your HVAC business. But which is the best app for HVAC companies? FieldSurf has already proven itself as the best app for many types of service companies – plumbing, electrical, locksmiths, cleaning services – and it is also the best app for HVAC companies. FieldSurf does everything you would expect a field service management program to do. It streamlines and automates every function of your business – Scheduling, Dispatching, Payroll, Accounting, and Inventory. Your staff will love FieldSurf and you will love FieldSurf when you see what it can do for your business. Let’s take a look at this incredible software which has been voted as the best app for HVAC companies. Before FieldSurf, scheduling and dispatching were fraught with problems. A dispatcher could easily double book a timeslot with two different technicians; it was possible to send the wrong technician to the right address, or send the right technician to the wrong address. A technician could bring the wrong Work Order or the wrong Invoice to the customer’s location; or your technician could send the wrong invoice to the customer. All these problems are eliminated when you use FieldSurf. The system prevents double-booking, and reduces or eliminates all the common mistakes made in scheduling and dispatch up to now. FieldSurf also does a brilliant job of handling and automating your payroll. Your technicians use FieldSurf to clock in at the beginning of their work day and to clock out at the end of their work day. In addition, FieldSurf requires your technicians to clock in upon arrival at the customer’s location, and then to clock out when they have completed the job. This makes calculation of your payroll a piece of cake. FieldSurf calculates the entire payroll function automatically. It calculates hours worked on each job and also calculates any commission on sales made by your technician. So payroll calculation is simple and automatic. And at any time during any payroll period, you can access FieldSurf and it will tell you what your payroll is for the current time. This information is available to you at any time, from any location, on any type of computer system – desktop, tablet or smartphone. Another critical feature of FieldSurf is its ability to give you total control of your inventory management. You always need to know exactly how much inventory you have on hand at any given moment: Fieldsurf puts total inventory management in the palm of your hand. Whenever you bring product into your warehouse, you enter each item into FieldSurf’s inventory module. You scan in a picture of the item, the product barcode, and the number of units. Whenever a technician takes an item out of the warehouse and places it in his vehicle, FieldSurf notes that event into the system. Then, when your technician sells the item to your customer as part of the job, FieldSurf adds the item to that job’s Work Order and Invoice, and deducts it from both the technician’s inventory and from the warehouse inventory. 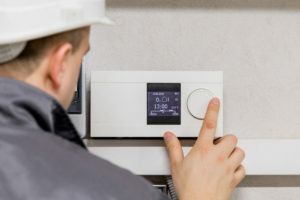 With FieldSurf’s HVAC software you always know exactly what inventory you have at any given time. And these figures are delivered to you in real time – your report will even reflect any sales you just made. Total inventory control means you never run of any item that you need and use regularly. When the number of units of any item gets down to a predetermined level, FieldSurf advises you of this. So you can reorder before you run out. Very few field service management programs out there have this capability to manage your Inventory control. If what you’ve read so far doesn’t yet prove that FieldSurf is the best app for HVAC companies, you will when you see what FieldSurf does for your accounting function. FieldSurf gives you total and instant control of your entire accounting function. In the “old” days, when you needed financial reports from your accounting department, you had to first request the reports from the accounting department, then the accounting people would have to generate those reports – sometimes manually and sometimes with another software program – and then you might wait for hours or days before those reports are generated. Then you had to go through hours of endless meetings while your accounting people presented those reports to you. Now, with FieldSurf, your financial reporting is all automated. With a few clicks, you or your accounting department can instantly generate reports of your sales for any period, and you can compare those sales figures with those from any other period. You can tell in an instant which of your technicians is performing well and which of your technicians might need some help. FieldSurf tells you everything you need to know about your business. And it delivers these figures in real time. You always know where you stand. You know which jobs are making you money, and which jobs are costing you money. You can compare performance by geographical area, or any of a number of criteria, and you can compare the current period with any other period. Your accounting people can generate any requested report in seconds. And best of all, you can generate those reports yourself. You don’t need to wait for anyone in your company to generate those reports: you can access those reports in real time, from any desktop or tablet computer, and even from a smartphone – meaning you can now access your entire business, including your financials and the entire status of every job, account and invoice in your business. There is nothing like FieldSurf to automate your business. Even if you’ve been using another field service management system, you owe it to yourself to take a look at what FieldSurf can handle, and how it outperforms every other field service management system on the market. If you own an HVAC company, take a look at FieldSurf and you’ll see why it is the best app for HVAC companies.